« Day 101 in Beijing: iPhone Your Date In. Day 102 in Beijing: This Ain’t Coming To America. Black or white bun? Have it your way. Eddie Murphy, in his heyday, was amazing. One of my favorite movies that he stared in was Coming To America. It was pure comic genius. It was also part love story. Eddie’s love interest worked in the family business. The family business being fastfood. Now, the dad who owned the fast food restaurant needed a catchy name to sell his food. He also used Golden Arches, red color for the uniforms and had food that seemed to be, coincidentally, exactly the same as McDonalds. Well, this pretty much seems to fit the bill. Because, unless I’m very mistaken, black buns for a hamburger, chicken burger or fish burger, ain’t Coming To America anytime soon. Now, I’m not passing judgment on the taste of the bun because I haven’t tried it. I’ve never been a big fan of fast food anyway so I’ll leave it to someone else to review it. I’m just saying that there is an interesting mental construct about black buns for me that makes me queasy. Maybe it is that it seems like something that is rotten and that makes me automatically makes me want to avoid eating it. 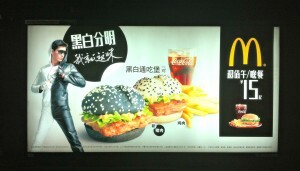 This is my cultural bias, and I admit that, and yet i’m still not going to eat at McDonalds. Or McDowells. Or any fast food place that has a black bun and compressed meat of some unknown type. Call me sheltered, call me boring, just don’t call me late to dinner. Unless you are having white or black buns. Then don’t call me at all.